It is an erect annual herb. Stem is dark green, quadrangular with longitudinal furrows and wings on the angles of the younger parts and slightly enlarged at the nodes. The leaves are glabrous, dark green, arranged opposite decussate, lanceolate and pinnate. The flowers are small, in lax spreading axillary and terminal racemes or panicles. The capsules are linear-oblong and acute at both ends. The seeds are numerous, sub-quadrate and yellowish brown in colour. Protects the liver and gall bladder. Reduces swelling and cuts down exudation from capillaries. Fights bacterial activity. 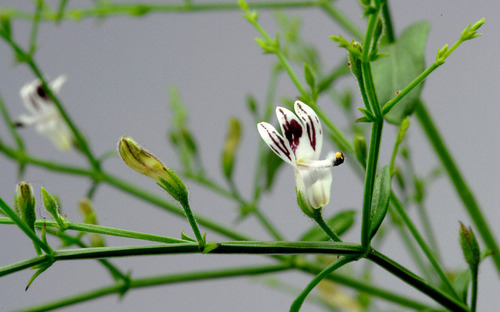 Although Andrographis appears to have weak direct antibacterial action, it has remarkably beneficial effect in reducing diarrhea and symptoms arising from bacterial infections. Promotes mucus discharge from the respiratory system. Blood sugar reducer, Immune Enhancement.